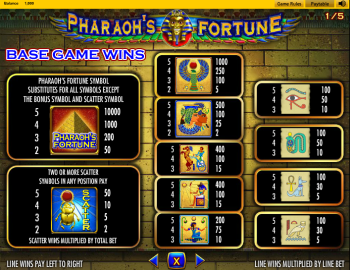 Explore the hidden depths of an underground Egyptian tomb to discover the Pharaoh's Fortune in this 5-reel, 15-payline free slots machine! 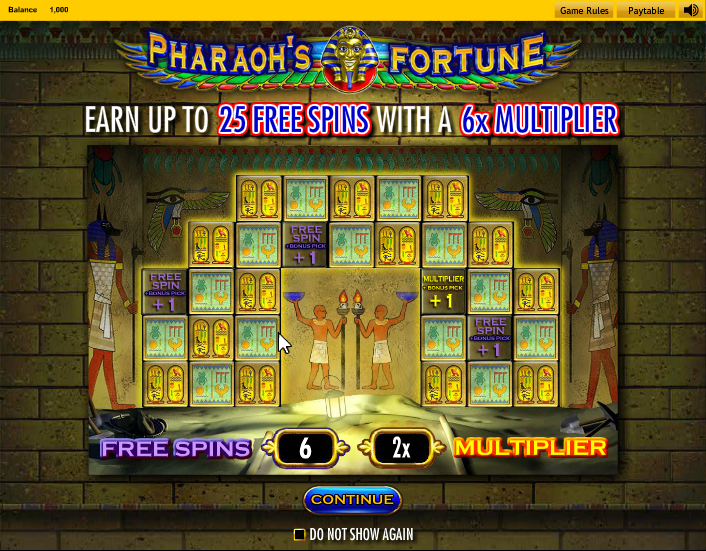 Explore the hidden depths of an underground Egyptian tomb to discover the Pharaoh’s Fortune in this 5-reel, 15-payline free slots machine! 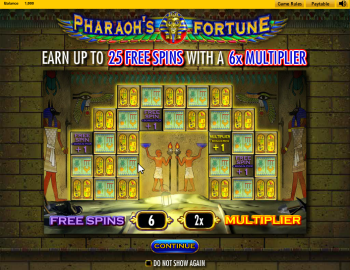 Deep within a tomb in Ancient Egypt lies the Pharaoh’s Fortune slot online. IGT have appropriately brought this slot machine online from their land-based casino cabinets as time has shown that players love the Egyptian theme and game as a whole. It could have to do with the well rounded and colorful graphics. 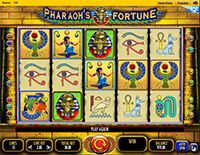 While the slot casing is cast in the tomb of a long passed Pharaoh, the symbols include the game’s logo as the Wild symbol, a snake, wolf, an Egyptian riding a horse with single-person chariot, an Owl, a Scarab scatter, a pair of Egyptians and more. 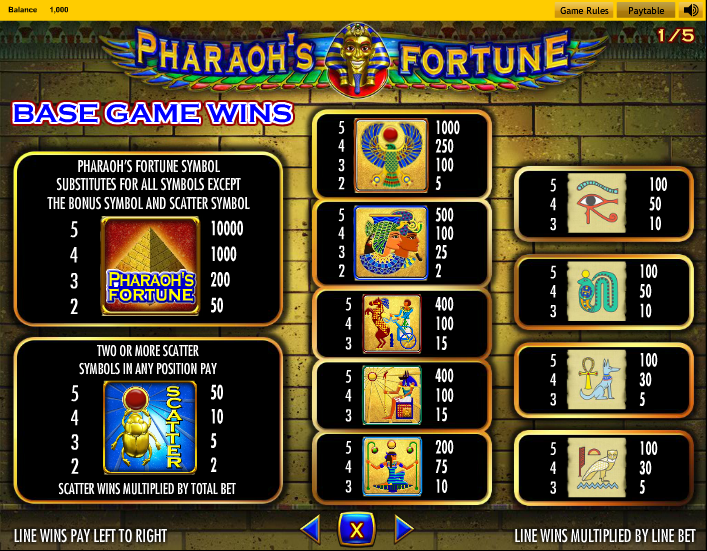 One way to win big on Pharaoh’s Fortune is to get 5 wild symbols represented by the Pharaoh’s Fortune Logo wild symbol. The wild symbol will substitute for any symbol except the Scarab scatter symbol or the Green Pharaoh symbol. 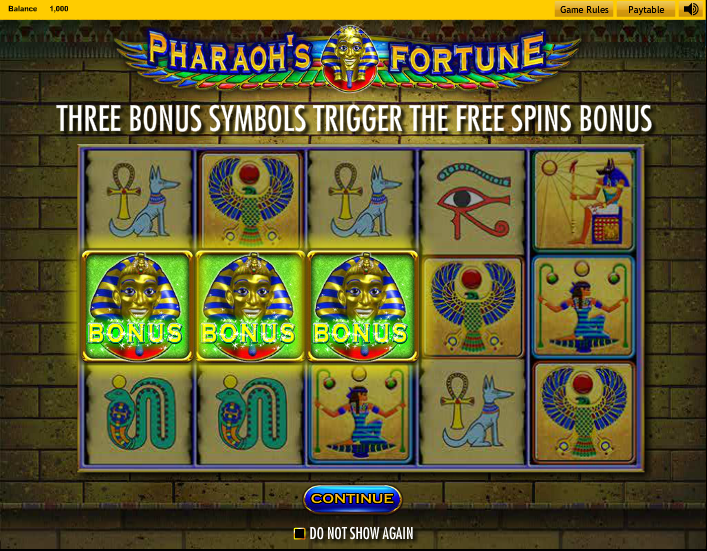 The Green Pharaoh symbol can appear on reels 1, 2, or 3 only and this is what triggers the free spins bonus round. You can also get 5 of a kind, 4 of a kind, 3 of a kind, and 2 of a kind to win a various payout amounts. 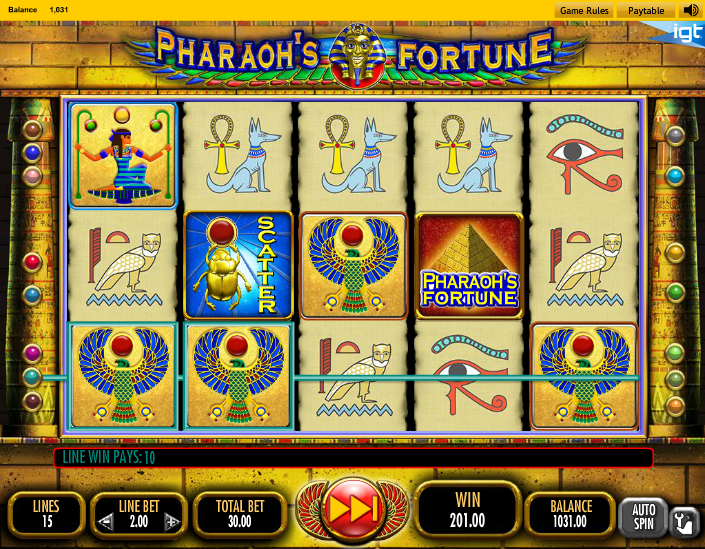 Scatter pays are also awarded when the Scarab Scatter symbol appears on any of the reels on any of the active lines. 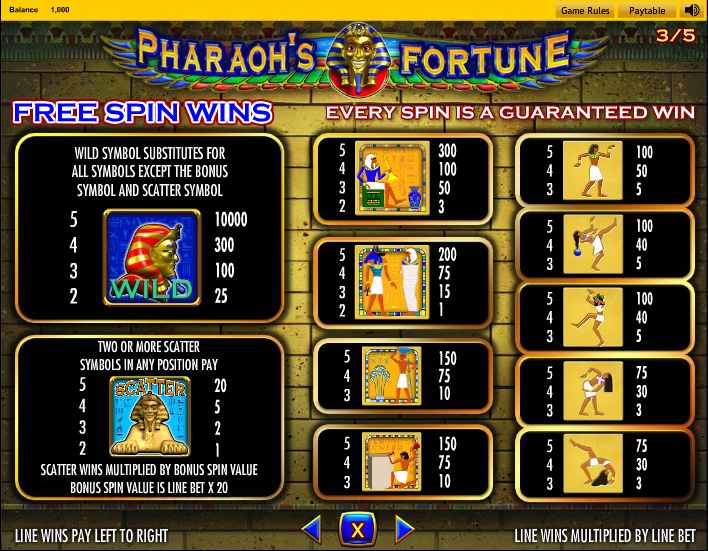 The bonus game is a Free Spins feature. To trigger this round you’ll have to get the green Pharaoh symbol on either reel 1, 2, or 3. From here you’ll pick a stone block, which then awards you with a particular amount of free spins. 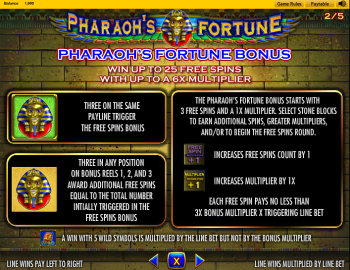 Continue to pick 5 different blocks and then get awarded a certain number of free spins with a multiplier based on your choices. 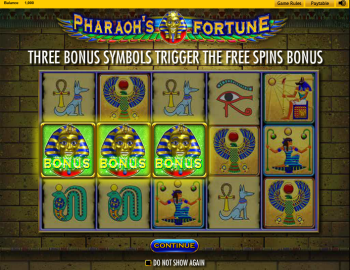 The symbols and paytable in the free spins round are completely different from the original game with a different song that plays in the background. 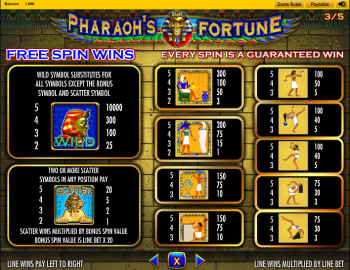 Once the free spins round is over, you’re taken to a different screen where winnings are presented across the screen with a boat and dancing Egyptians. 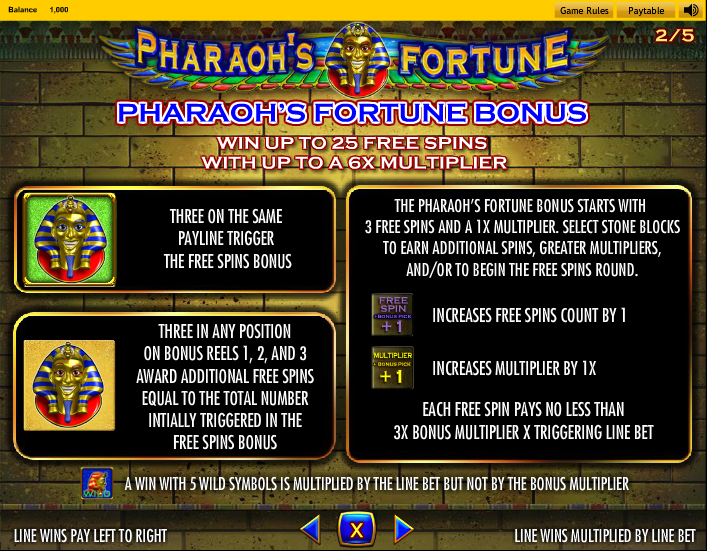 The maximum amount of free spins you can get is 25 and a maximum multiplier of up to 6X the original bet.